Producer Sherman Alexie in attendance Thursday (Feb 27)! Directors in attendance Thursday, Friday, Saturday (Feb 27 - Mar 1)! Cast & crew, including Chaske Spencer (the Twilight Saga) in attendance Thursday & Friday (Feb 27 - 28)! Virgil First Raise wakes in a ditch on the hardscrabble plains of Montana, hungover and badly beaten. He sees a shocking vision: his father, ten years dead, lying frozen at his feet. Shaken, Virgil returns home to his ranch on the reservation, only to find that his wife, Agnes, has left him. Worse, she’s taken his beloved rifle. Virgil sets out to town find her— or perhaps just the gun— beginning a hi-line odyssey of inebriated and improbable intrigues with the mysterious Airplane Man, his beautiful accomplice, Malvina, and two dangerous Men in Suits. By embracing—and no longer fleeing—his memories, Virgil is finally able to thaw the ice in his veins. Northwest Film Forum partners with Longhouse Media to present the ongoing series Indigenous Showcase, spotlighting emerging talents in indigenous communities. 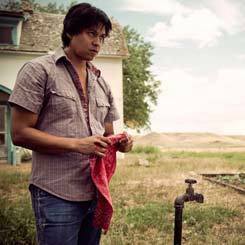 This exciting program exemplifies how Native American and indigenous filmmakers are at the forefront of the industry, successfully establishing a dialogue and creating images that are challenging and changing long established cultural attitudes towards indigenous culture. The mission of Longhouse Media is to catalyze indigenous people and communities to use media as a tool for self-expression, cultural preservation, and social change. Please note opening night at 6:30pm is sold out. There are a few tickets still available for the 9:30pm Thursday showtime. Weekend tickets are selling fast, and we recommend advance purchase online to guarantee seating. Film stills on this page by Ken Billington.